The analysis shows that private law and in particular intellectual property law expertise is almost entirely missing from the Court. However, we find that the Court has developed a mechanism for enabling judicial learning through the systematic assignment of cases to certain Judges and AGs. 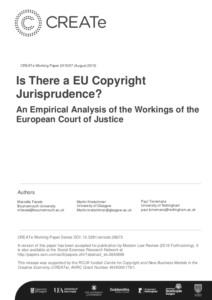 We also find that the Court has developed a “fair balance” topos linked to Judge Malenovský (rapporteur on 24 out of 40 copyright cases) that does not predict an agenda of upward harmonisation, with about half of judgments narrowing rather than widening the scope of copyright protection. A version of this paper has been accepted for publication by Modern Law Review (2016 Forthcoming). It is also available on SSRN at http://papers.ssrn.com/sol3/papers.cfm?abstract_id=2643699.